I'm going to Boston to see my doctor. He's a very sick man. He's so small, he's a waste of skin. If the grass is greener in the other fellow's yard - let him worry about cutting it. Most of us spend the first 6 days of each week sowing wild oats, then we go to church on Sunday and pray for a crop failure. Radio in the 30's was a calm and tranquil medium. Oleaginous-voiced announcers smoothly purred their commercial copy into the microphones enunciating each lubricated syllable. Crisis is a word used in advertising circles to refer to any incident to which the word "emergency" cannot be applied. The president of the new agency had been a famous quarterback in college football an old wives tale told around the water cooler in the office related that, after he had left college when ever he met other players who had been on the team with him he could never recognize the fellow until he asked him to bend over. The college quarterback started sending turtle-necked memos which intimated that, as the mink sayed as it backed into the electric fan, "the fur is going to fly". A new headache tablet would be distributed to the staff and probably be very welcome. In the advertising game (it isn't buisness) a headache is an occupational side effect. This man used to talk to himself incessantly. We called him the one-man conference. This gentleman nursed two secret ambitions. The first was to put a day bed in his office so that he wouldn't have to sleep sitting up during conferences. His second and greater ambition was to keep changing elements we had in the program. A conference (committe) is a gathering of important people who singly can do nothing but together can decide that nothing can be done. California is a fine place to live - if you happen to be an orange. A committee is a group of the unprepared, appointed by the unwilling to do the unnecessary. I always have trouble remembering three things: faces, names, and - I can't remember what the third thing is. I play a musical instrument a little, but only for my own amazement. I'd rather have a full bottle in front of me than a full frontal labotomy. Some movie stars wear their sunglasses even in church. They're afraid God might recognize them and ask for autographs. Television is a device that permits people who haven't anything to do to watch people who can't do anything. Television is a medium because anything well done is rare. A kind of radio which lets people at home see what the studio audience is not laughing at. Fred Allen: Jack, you couldn't ad lib a belch after a plate of Hungarian goulash. Jack Benny: You wouldn't say that if my writers were here. Fred Allen: Why you fugitive from a Ripley cartoon ... I'll knock you flatter than the first eight minutes of this program. Jack Benny: You ought to do well in pictures, Mr. Allen, now that Boris Karloff is back in England. Fred Allen: Why, if I was a horse, a pony even, and found out that any part of my tail was used in your violin bow, I'd hang my head in my oatbag from then on. Fred Allen: Tomorrow night, in your ermine robe, you will be whisked by bicycle to Orange, New Jersey, where you will be the judge in a chicken-cleaning contest. Jack Benny (rapturously): I'm KING for a Day! 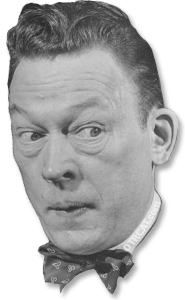 Fred Allen: Upon our stage we have a Hoffman pressing machine. Jack Benny: Now wait a minute! Wait a minute! Fred Allen: An expert, operating the Hoffman pressing machine, will press your trousers. Jack Benny: NOW WAIT A MINUTE!!! (total audience hysteria laughter, as Benny's pants are literally removed). Jack Benny: Allen, this is a frame--- (starts laughing himself) Where are my pants? Fred Allen: Keep your shirt on, king. Jack Benny: You BET I'll keep my shirt on! Jack Benny: Come on, Allen, where are my pants! Fred Allen: Benny, for 15 years I've been waiting to see you here like this! Jack Benny: Allen, you haven't seen the END of me! Fred Allen: It won't be long NOW! Jack Benny: I WANT MY PANTS!